Instant Imprints Little Rock | Custom T-Shirts, Embroidery, Signs and More! At Instant Imprints Little Rock, our customers come to us when they want to be more visible to their customers. We create that visibility five different ways: Branded Apparel (embroidery), Signs & Banners, Promotional Products, Custom T-Shirts and Print Services. Hilltop Electric has done business with Instant Imprints for years - they do all our shirts and ad signage and we will never go anywhere else. Instant Imprints actually put the signage on all of our trucks and trailers - we are very proud of the outcome. As our Company grew they were my resource to be sure our employees and equipment looked professional. Whether you’re looking for custom t-shirts, printing services, promotional products, custom banners or branded embroidery items, Instant Imprints in Little Rock has what it takes to take your brand visibility to the next level. No matter what kind of products you’re looking for to give your business a greater impact, our Image Experts have what it takes to see your custom t-shirt or banner through, from your initial idea to your finished promotional product. Just try saying “custom t-shirts near me” into your smart speaker next time you’re around North Bowman Road in Little Rock! When you need a world-class printing solution but also want the local, personalized touch of a Little Rock storefront, let Instant Imprints be your promotional partner. We make it a point to get your job completed on time, with quality that exceeds expectations. In addition, our professional print shop gives you the power to get your job done right the first time, avoiding the costly revisions that cut-rate printing service providers can induce. The power of custom t-shirts is well known throughout the business community—virtually any global brand has custom tees of their own. Wherever your shirt travels, your brand’s values can be spread, throughout Arkansas and beyond. If you’re looking for a classier way to stand out, our custom embroidery options make it easy to add style to your business shirts. Our state-of-the-art printing processes bring a new level of clarity, affordability and durability to your designs. Get the best custom t-shirts in Little Rock with Instant Imprints! One of the most tried and true forms of advertising around is the custom sign. From the days of old, when a carved wooden arrow would point you toward the prospector’s office, to today—with shapeshifting billboards that appear holographic—we can see that the custom sign or banner is unlimited in its potential. 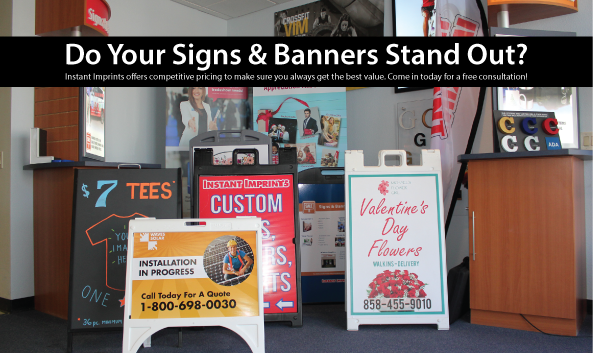 No matter what your needs are on the promotional spectrum, stop in at Instant Imprints in Little Rock and you can take your brand visibility to the next level. If you are looking for some unique ways to promote your brand, pay a visit to our showroom on North Bowman Road. You’ll be able to envision your logo on a range of custom branded promotional items. Stop by today, give us a call at (501) 217-8222 or request a quote online to get started today!